Students listened intently yesterday as President Bush and first lady Laura Bush held a reading session at Pearl Harbor Elementary School. It wasn't the sort of question you'd expect from a boy who's not yet 7, and it stumped President Bush. 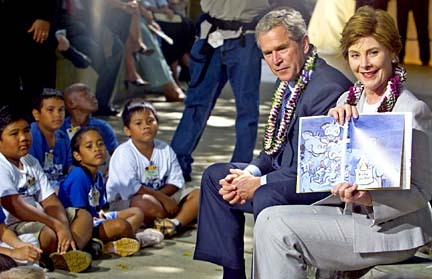 After first lady Laura Bush read "Giggle Giggle Quack," a book about a troublesome duck, to second-graders under a banyan tree at Pearl Harbor Elementary School, Darrell Florence asked the president what was the square footage of the White House. "I don't know the square footage, but I know there are a lot of different floors," Bush responded with a laugh. Darrell and his classmates seemed impressed nonetheless. "He didn't know, but that was OK, he's the president," Darrell said, with a smile and a shrug of his royal blue aloha shirt, after the Bushes had left. "I've wanted to see this man all my life. When I saw him, I was so happy." Darrell's encounter with the president almost didn't happen, because Wednesday was supposed to be the precocious youngster's last day at school. 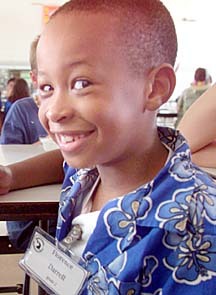 His father is in the Navy and is transferring to Fairfax, Va., and the family flies out of Hawaii today. The Bushes' itinerary was kept secret, but Darrell's teacher, Jennifer McCord, urged his mother to let him come to school one more day because something special was going to happen. "I knew that he would just love this," said McCord. "He'll remember this the rest of his life. All the kids will but he's especially into social studies." 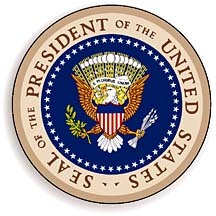 Darrell Florence: The student says he has wanted to see the president "all my life"
The White House requested that the Bushes visit a second-grade classroom, but officials later decided to have the gathering outside so all 100 second-graders could be part of it. The Bushes left cards of themselves and their dogs for the 600 children at the school. The first lady, a former schoolteacher and librarian, urged the students to read more than they watch television. Her husband told them that one of the fun things about being president was being able to "work on things that matter, like making sure everyone learns to read." The Bushes met with the principal and several teachers to discuss how Pearl Harbor Elementary handles reading. The school recently met academic benchmarks in the No Child Left Behind law, which may be why it was chosen for the presidential visit, said Principal Ellamarie Savidge. "Both the president and Mrs. Bush seemed very down to earth," she said. "It was a lot less stressful than I thought it would be." Asked over lunch if he knew how big his own house was, Darrell, who turns 7 on Halloween, had to admit that he was in the same league as the president. "You know what? Actually, I don't know," he said. For the record, the official White House Web site says it has 132 rooms, but does not list a square footage. The Enchanted Learning Web site says it measures 55,000 square feet. Staff writer Richard Borreca contributed to this story.